The new spot takes consumers inside Deadpool’s dream, where he rides a unicorn through a supermarket in search of a sandwich to satisfy his superhero cravings. Along the way, he encounters various characters from a casino of frozen food characters to a sassy little girl (who asks if he is “selling out”), before escaping with DEVOUR’s new sandwiches into a giant dream-like microwave. Wildness, Beef & Sage and Baked studios were involved in the campaign, which will run on out-of-home billboards, digital and social media platforms, as well as point of sale in 9,000 stores across the US. 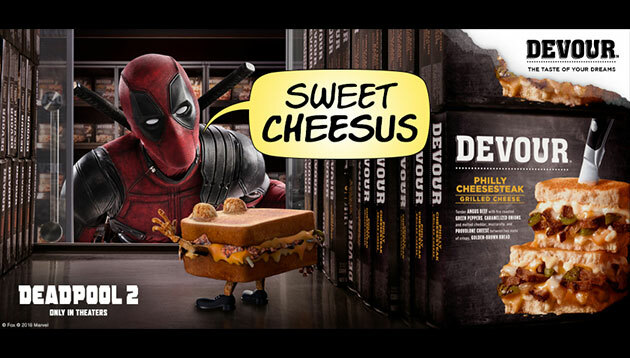 The campaign also includes custom DEVOUR packaging featuring Deadpool. “We believe you shouldn’t have to compromise taste for convenience, so we designed our new sandwiches to taste like food you would find at a restaurant. You would never believe that our new sandwiches come from a microwave,” Katy Marshall, marketing and sales lead for Springboard, said. Springboard is a platform launched by The Kraft Heinz Company in March to nurture, scale and accelerate growth of disruptive US brands in the F&B space. According to YouTube, users are less likely to be interrupted by ads in the later part of a video when exposed to two ads in a bre..
It’s a sad week for Dark Knight fans as Warner Bros officially announced that Ben Affleck is set to take on the role as Batm..